Demonstration of printed thermochromic samples for inspiration. Participants will have chance to mix their own combinations of thermochromic pigments, fluorescent pigments and other colours and choose fabrics to work with (from a selected range) and test colours. We will also have some ready mixed colours available. Each participant will be given a screen with a geometric pattern – there will be 8 screens with 8 patterns – each pattern can be used individually but they can also be combined with another pattern to create a transformational colour-changing pattern. 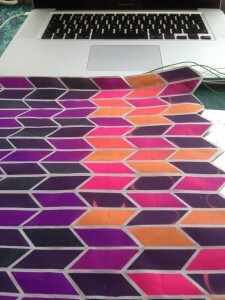 Participants will swap screens and create a range of colour-changing patterns with their own colour combinations. Participants will be shown examples of a simple geometric heat-sink that can be used to activate the colour-change within modular sections of their patterns.